Want to start up a blog, but not sure where to start? I’ve got you covered! Today we’ll be going into the different domain registrars and hosting companies I’ve personally used and love, as well as places to look for awesome themes when you’re just starting out. Step 1: Pick out a domain name & get it registered! Once you have your website name in mind, hop on over to Namecheap or Godaddy to see if it’s available. If it is, you can just add it to your cart, purchase it and keep it on hold for now. Note: If you plan on purchasing your domain + hosting from the same company, you don’t have to mess with connecting the two. Move onto step 3 whenever you’re ready! Step 2: Pick a platform to host your blog on. There are loads of hosting companies to choose from, but I’m going to go over 2 that I’ve used, love and highly recommend! Bluehost is definitely one of the best hosting companies I’ve tried, and always has incredible deals on their hosting plans. Their most recent special is $3.49 per month and comes along with a free domain name. Which is perfect if you’re not super tech savvy and want to avoid having to change name servers and other technical things of the like. Plus, their customer service is incredibly helpful and prompt if you have any questions or run into any issues. The runner up for first place is Namecheap hosting. Their Value hosting plan starts at $10 for the first year, then jumps to about ~$40 the next year. They promote 100% uptime which means you don’t have to worry about your site not being available. I’ve also personally used their customer service live chat several times and love how fast you can get help with any questions you might have. Note: If you bought your domain and hosting separately check out the articles below for tips on how to connect them. And now for the fun part- personalizing your blog with a theme! Here are a couple different places you can find templates for your blog. 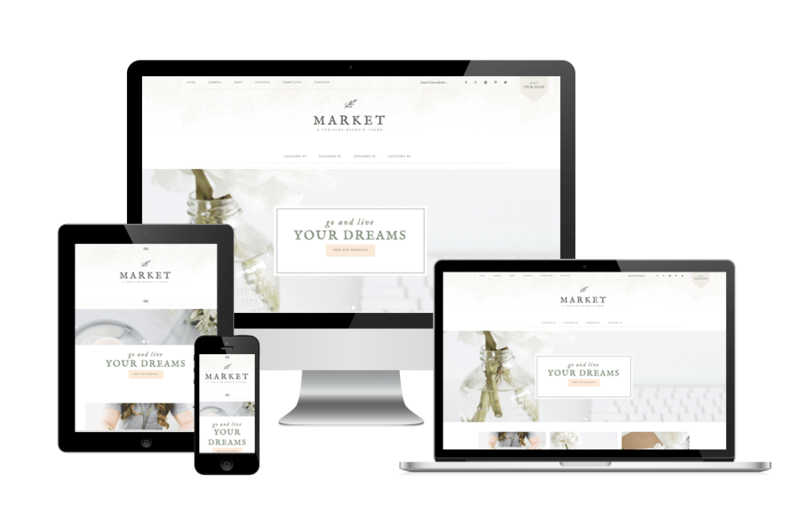 These themes are feminine, chic and perfect for new bloggers + online entrepreneurs. With mobile responsiveness, multiple areas for advertisement banners, and being SEO optimized, the themes from Angie Makes are an awesome option to start with to build a strong foundation for your blog. These are also highly customizable, to the point where you can adjust site width, content width, padding, fonts, etc. Check out a few of the themes available! If you’re looking for themes specifically designed for female entrepreneurs and bloggers in mind, you have to check out Restored 316’s themes. They’re creative, feminine, easily customizable and start at $50+. They also offer installation services if you don’t know your way around WordPress just yet. Here are a few samples of their themes! There you have it- 3 easy steps to Let me know if you’ve decided to start your blogging journey in the comments, and leave your link if you’d like as well. I’d love to see your new blog!